A map of Florida, excluding Vice City and Cottonmouth. 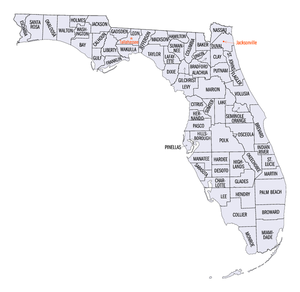 The State of Florida is a real state in the United States home to fictional Rockstar Games' cities such as Vice City and Cottonmouth. Vice City: Grand Theft Auto: Vice City, and Grand Theft Auto: Vice City Stories take place here. Cottonmouth: Manhunt 2 takes place here. Despite Vice City being stated as being based off Miami, both could possibly exist in the GTA world, due to Ray Machowski mentioning Miami in Grand Theft Auto III. Much like California still exisiting alongside the state of San Andreas as opposed to replacing it. This page was last modified on 17 July 2012, at 13:04.